I’ve had experience with implementing a payment gateway to accept cryptocurrency on a WordPress ecommerce shop thanks to working for 2amigos Consulting Group. For those who may not know, WordPress is a CMS (content management system) that is widely used and makes it easy for developers and non-developers alike to create websites. Having only worked with WordPress to accept cryptocurrency limits my experience somewhat, but I will discuss generally strong principles and methods that can help anyone who’s looking to accept cryptocurrency as payment on their ecommerce shop, particularly if you’re unfamiliar with or new to crypto. I will also discuss specifics and details for those who are working with WordPress. If you are new to crypto, let’s discuss some important details that will give you the basic knowledge you’ll need to get started. For those with a solid knowledge of crypto already (particularly how wallets work), skip to the next paragraph. Similar to physical or fiat currencies, you need to “put” your cryptocurrency somewhere. Crypto wallets are essentially where you “put” or “hold” your currency. Public keys identify wallets, which are used by others to send you coins. When someone makes a purchase on your shop they send the correct amount of coins from their wallet to yours. For WordPress, you won’t need to know much more than this. If you are coding an ecommerce shop, you need to research which specific currencies you want to accept as different currencies require different implementations. For WordPress, you can use a plugin to accept cryptocurrency on your shop. There are many different ones with advantages and disadvantages for each. I’ll explain some of those differences along with how you set up a crypto plugin and get your shop ready to accept crypto. I’ll also delve into testing which I haven’t seen discussed in any articles on crypto plugins. Testing doesn’t get enough attention and it’s even more important for those who aren’t using WordPress and are coding their own shops. Not every plugin accepts every cryptocurrency that is available. Most people have heard of Bitcoin. Maybe you know of another cryptocurrency, such as Ethereum. However, hundreds of different coins exist, but you likely won’t use them all. Different plugins let you use different currencies (and less popular and less used currencies will likely be accepted by fewer plugins). If you’re looking to accept a specific currency, make sure a plugin lets you accept that currency first, especially if it’s one you’ll be paying for. Another important difference among plugins is whether or not the plugin creates your wallets for you or you must use your own wallets. 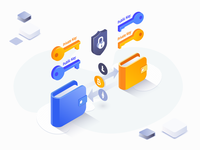 Many people involved with crypto or who already have wallets may prefer to use their own, but those who are new and unfamiliar with crypto might find plugins that create the wallets easier. If you do need to create your own, don’t worry, there are a lot of great wallets out there. Often, this is software you download though there are physical wallets. You can even get wallets in apps on your smartphone. Some wallets are only for one specific currency (only Bitcoin, only Litecoin) while others work for many currencies. If you are starting out, it will be easier to use as few wallets as possible. Try to find one wallet that holds all the currencies you want to accept. Another big difference in plugins is whether or not they automate the entire checkout process for your user (the transaction is done entirely on the store) or if the plugin simply gives the user your wallet’s address and they must send you the crypto from their own wallet themselves. For those who are new, this probably won’t make a big difference, but some people do have a preference. Finally, some plugins take a small fee per transaction. That’s something that many people want to avoid. Make certain that you research the plugins for whether or not they include fees. When you’ve installed and activated your plugin, it may have different settings you can customize. Make sure you check the plugin’s settings, as well as the settings inside any other plugin you’re using for your shop (for example WooCommerce or Easy Digital Downloads) as sometimes the settings you need for your crypto plugin appear there. Making sure that your settings are correct is extremely important because lots of plugins let you activate or deactivate certain currencies, change how long a user has to pay, edit what messages or emails they see when they make a purchase, etc. Some plugins even have a user agreement you must sign to use their services. Take your time and make sure that you set up your plugin correctly. Like many plugins, crypto plugins on WordPress often have directions, FAQ, or documentation to guide you through the process. For those who are coding their own shop and not on WordPress, setting up your actual website to watch and communicate with blockchains will be the most difficult part and you won’t get enough information on that subject from just this post. It will greatly depend on which currencies you plan to accept and will be fairly time consuming, particularly the more currencies you utilize. If you want assistance with your custom implementation needs, 2amigos can help. Send us a message via the contact form. Most developers understand the importance of testing and make a habit of it. When dealing with cryptocurrency it is especially important. Ideally, start with testnet coins before jumping into mainnet. Mainnet is actual, real cryptocurrency; whereas testnet isn’t real and lets you test. It works the same and lets you test without exchanging actual cryptocurrency. If you aren’t a developer and are just working with WordPress, many cryptocurrency plugins only accept mainnet (real) coins and should have been tested by the developers of that plugin. It is still important that you test the plugin yourself. Make sure it works properly on your website and in your environment with everything else you have set up. Rule out the possibility of a conflict between the plugin and some other aspect of your WordPress website like a different plugin. Especially when dealing with money, you can avoid worst-case scenarios with some prudence and testing. Further, testing is actually a fairly easy process. I’ll lay out the important steps for testing a crypto payment gateway. It’s important when testing your site to consider that if it’s live like most sites (changes you make appear instantly for users), you might want to take your site offline or put it in some kind of development mode to test so users won’t be confused or alarmed. Now, once your currency is set up and you have a wallet to accept coins (either one created by your plugin or your own) you’ll need another wallet to send the coins from. 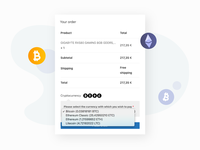 Test as if you’re a user coming to your site, planning to send coins from the user’s wallet (your second one in this case) to the actual wallet for your site that is meant to receive the coins. This activity lets you test and step through the same process a user of your site experiences. Create your second test wallet. You can use the same software you used to create your first wallet(s) or a different one. Get some coins of the currencies you plan to use/test. I would recommend small amounts just so you don’t spend that much money testing. NOTE: With some identification (license, passport, etc) and a little time, you can get coins from an exchange. If you already know someone who could send coins to you, that works too. This might feel like a challenging step in the process, but if you do your research and find a good exchange or other means of getting coins, it’s fairly straightforward. Create a few very cheap products on your shop that you can buy to test. Once you have coins, make a purchase and follow the steps for your specific plugin. Send the coins from your test wallet to your actual wallet. NOTE: The coins won’t always show up instantly in the wallet receiving them and can take anywhere from a few minutes to hours (though it doesn’t usually take this long). Sometimes, depending on the currency, transactions can get hung up. I can’t cover every possibility for there is a lot to know about crypto but this is why you test in the first place. You’ll not only have the right mindset for finding problems, but if you do hit a snag, there are resources to resolve it. You can look at FAQs or documentation for your specific plugin. Research your errors or problems online. Lots of information exists for almost anything you can encounter related to crypto. Try forums or ask anyone you know who works with cryptocurrency or Wordpress. Testing allows you to address specific problems you encounter and make sure a user’s experience on your shop will be smooth. 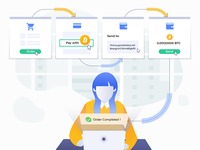 Once you’re confident you’ve fully tested transactions and users can complete orders using their coins, you’ll be ready to accept cryptocurrency as a form of payment on your ecommerce shop. This does take effort. While I can’t cover everything you need to know in one post, you’re better prepared now and can use this as a guideline. 2amigos Consulting Group can help you integrate a 3rd party crypto payment solution or build your own secure custom solution to accept crytpocurrency payments. Have a need or an idea? Get in touch and let’s talk.